I don't mean ingame as i'm lazy to do stuff there. I mean the social side of this game. It's really great. There are alliances and empires or like we think-familys. Ppl are really great and and care for each other. There's no back-stabbing and such. Ppl do leave alliances and join others (even enemy alliances, if you can call it like that), but there's not much anything, well, awfull. Even Ricos, nothing personal, who like to bully others, are actually really great. They care for theyr own! This came because of another game i play. There's 2 big alliances (like empires in GW) and one is in top and then in time it's taken down and the other will be up there. It's not like in GW, that you can just rebuild and it's ok. It takes time to get back up and you can't get anywhere without teamwork. And thats the sad part. People want power. They'll stab theyr own just to be at the top place and even join the enemy for that goal. There's lots of treachery and that i really hate. Recently an old enemy alliance joined with our empire (GW terms, so it's understandable), but lately after they reached the top, they betrayed us and made a new empire and even an alliance from the first days of that game, joined them. Again because of power! Thats why i really love GW. People are great and care for each other and that makes this game fun. Hmm, yeah, it's a pretty good game like that. Too bad it's not more popular - but then again, that would bring all kinds of people to the mix, so maybe it's OK this way. Lol, you guys have mixed things up. Phalax, you were the penguin guy, so whats abiut with the sudden spiders? Don't worry, Krissu, I'm still against the penguins. I'm supporting the spiders because they have the best chance to win against the feathered beasts. First bird flies. Second bird pecks. Penguin does neither. Ergo, penguin stands even less of a chance on land. Quod erat demonstrandum. And spiders will carry them to their underground burrows from where nothing gets out alive. An epic fight is going on. Someone should make a movie out of this. 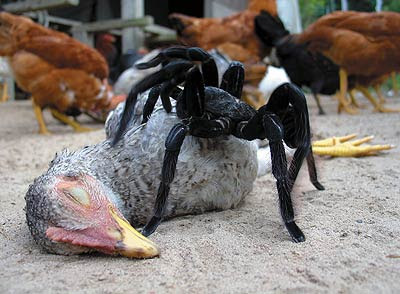 Spiders turn the tide and win by spinning a giant web; the penguins get caught in it and the spiders eat them.